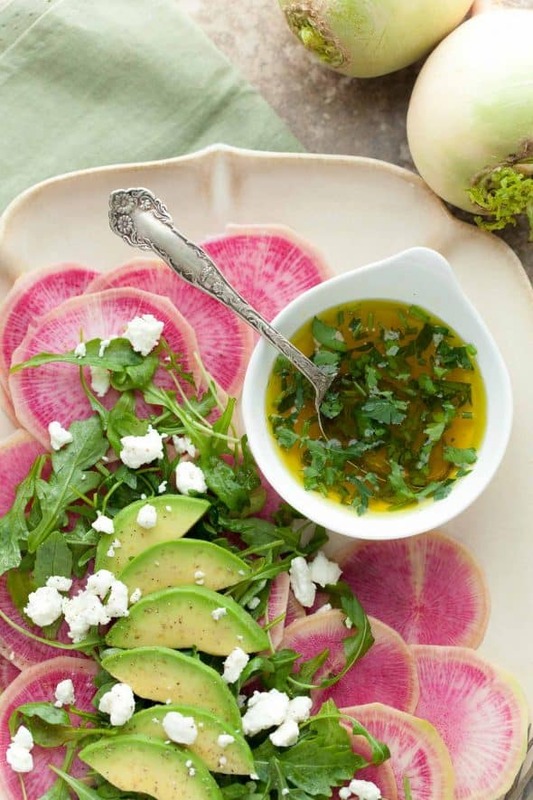 Watermelon radishes are shaved paper thin and dressed with a citrus avocado vinaigrette. Slice through its unassuming pale green exterior and a striking, brilliant magenta center awaits you. With an unexpected inner beauty that captivates, this beautiful jewel-toned vegetable commonly known as a watermelon radish adds a lovely color and refreshing crunch to salads and is worth seeking out. Pleasantly crunchy, a bit milder and sweeter than its red-skinned cousin it’s a real gem of the vegetable world. While frankly I’m happy to enjoy them raw, sliced and sprinkled with a generous pinch of good sea salt when I find them, they also make for an elegant salad. 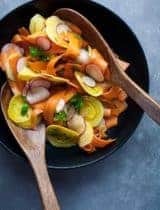 I’ll take any excuse to pull out my mandoline, so I’m particularly fond of serving them shaved paper thin and layered on a platter dressed with a bright citrus and avocado oil vinaigrette. It’s a Carpaccio of sorts; a riff on the traditional with a fresh springtime twist. 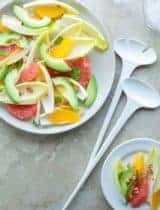 The thin slices of the watermelon radishes are first tenderized with a sprinkle of salt, then drizzled with fresh orange juice and avocado oil and topped with wild arugula and creamy slices of avocado. The whole thing radiates with vibrant colors and bright flavors. 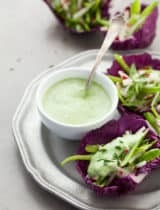 The peppery bite of the arugula makes a nice foil to the richness of the avocado and crispness of the radish slices. I also like to add a few crumbles of tangy goat cheese to finish the whole thing off but that’s entirely optional and up to you. 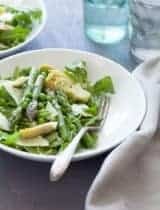 Part of what makes this salad feel like a special occasion is in the presentation but it’s equally wonderful all heaped together like any other salad if you’d prefer and entirely light and inviting. A light and refreshing salad of thinly sliced watermelon radishes topped with arugula and avocado. Peel the outer layer of the watermelon radishes if thick. With a sharp knife or mandoline, thinly slice the radishes into rounds. Sprinkle sea salt over the radishes in a colander set over a bowl. Cover and set aside for at least 20 minutes. Drain radishes, and lightly pat dry. Arrange the slices on a serving platter or individual plates. Make the vinaigrette by whisking together the orange juice, avocado oil and fresh herbs. Add a pinch of sea salt and black pepper to taste. Toss the arugula with half the dressing. 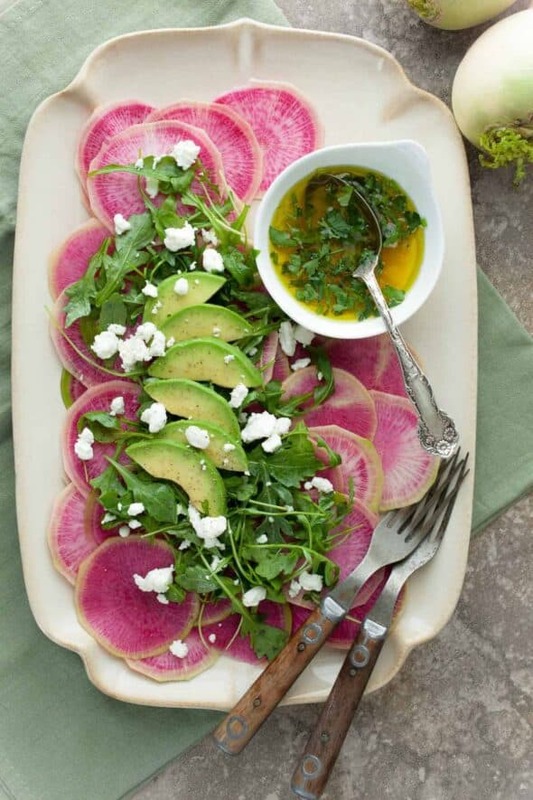 Place a handful of dressed arugula on top of the sliced radishes and top with a few slices of avocado. 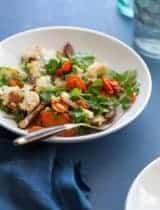 Garnish with crumbles of fresh goat cheese if desired and drizzle the remaining dressing over the top of the radishes. Serve immediately. Sylvie, just gorgeous! The Watermelon radishes are something that I've gotten before, ages ago, in a CSA box but it's been years. I wish I had prepared them half as beautifully as you did! Love that you used the radish to make a carpaccio. So appropriate with its blushing good looks! I must admit that I've actually never had a watermelon radish, though I've seen pictures of them and have always been struck by their gorgeous color. This carpaccio is brilliant, starting with the inclusion of avocado and goat cheese and then the dressing completely brightens it up. this is just gorgeous Sylvie!! and I bet it's every bit as delicious! So stunning! I'll be on the lookout for those radishes. I have only tried Watermelon Radish pickled. You have inspired me to pick some up. That is one seriously beautiful plate of food! I have never tried Watermelon Radishes but oh they are BEAUTIFUL!!! That last shot is a stunner! I love watermelon radishes, especially the way they vary from piece to piece, like blood oranges, it's always a surprise when you cut into one. Seriously gorgeous Sylvie!! Just wow. I love how you see the world and food! How beautiful, I've never seen watermelon radishes before but that magenta hue is quite striking! Oh man, I want to find some watermelon radishes now--I'd never heard of them before! STUNNING!!! I hate watermelon, but watermelon radishes paired with avocados sounds amazing! OH. MY. YUM! This is seriously gorgeous and seriously delicious sounding! I am definitely going to have to make this...and will Pin it onto Delicious Karma's Pinterest and share via Twitter and Facebook. This is just too stunning not to share! Thank you for such wonderful inspiration! Oh how pretty. I love the look of watermelon radishes and the pink and green is so spring like. Now that looks gorgeous! What colors! Thank you Ken, that's very kind of you to say. I have never had a watermelon radish - but I will make it my quest to find them! This looks perfect. Gorg! Fucshia pink and grassy green are my favorite colors…especially together. Love avocado anything. Never tried Watermelon Radishes before though. Must seek them out ASAP! Just beautiful, Sylvie! I love how bright watermelon radishes are. I wish I could find a decent source. I guess I'll just have to come there. Pick me up at the airport? I've never had the opportunity to try them, but they sound delicious. You really have a knack for describing flavors! On my "to eat" list. Wow, these photos are stunning. 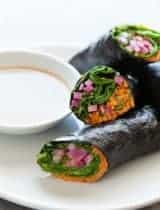 I'd love to try this out soon, it looks delicious. This looks absolutely incredible and fresh! 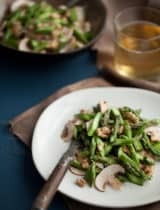 Looking at this kind of dish makes me want to make/write a savory entry in my blog. Keep up the great work! I've never had watermelon radishes but my they are pretty! And I love regular radishes. Just stunning Sylvie! I have yet to find watermelon radishes, but would love to get my hands on some. Beautiful color. I love the recipe so much! This is so gorgeous I might be too afraid to eat it... they key word being "might". I would totally eat this. Wow Sylvie! 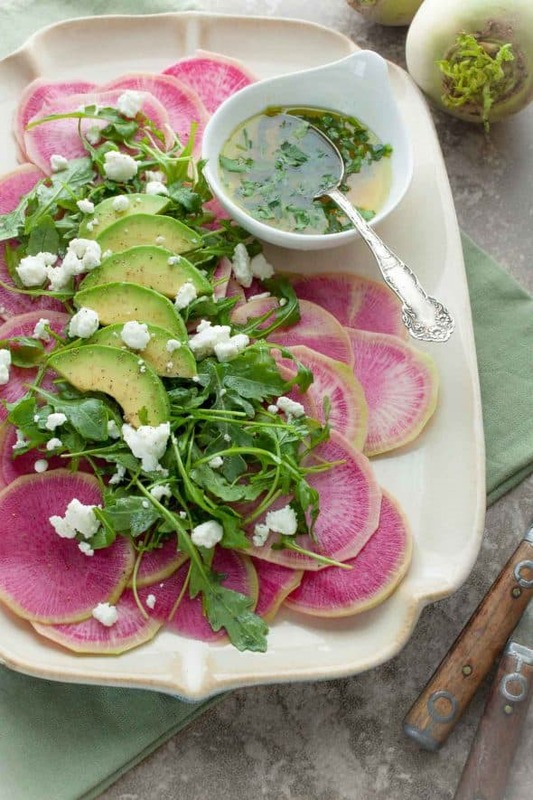 The carpaccio idea works beautifully for these radishes...the whole salad looks beautiful! You are my greatest inspiration as a photographer. I just love your work so much! Aw thank you Jen, that's really nice of you to say. It´s fantastic! I will try it! Such a beautiful carpaccio. I love these watermelon radishes! LOVE this carpaccio!! And the vibrant watermelon radish is perfect for spring colors! Seriously, so pretty and always pleasing to eyes! Your salad took my breath away! SO elegant and gorgeous. I've never tasted or maybe even seen watermelon radishes and I'm going to track down these gorgeous radishes! You really know how to prepare the food simple yet flavorful. 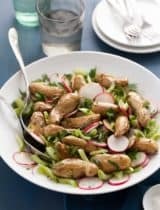 I can't wait to try this as soon as I find watermelon radishes! Watermelon radishes are so vibrant and with your beautiful plating it's a mesmerizing dish. Almost too pretty to eat! This dish is beautiful. I love the textures and colors. I'm sure it tastes amazing too! This is such a beautiful salad and so beautifully presented! I had not heard of watermelon radish before. I will look out for these now! oh my.. those radishes are so gorgeous. and beautifully captured! the freaking color of those radishes stun me! They are absolutely gorgeous and breathtakingly beautiful. I want to eat them all and I am not a fan of radishes usually! Gorgeous carpaccio and your pics. The vibrant combination of color from radish and avocado pitches me. I won't be tasting any of the jeweled beauties before the farmer's markets come into full swing, I have the hardest time finding them! But these photos are definitely motivating me to start searching. Just lovely! Oh wow - this looks so gorgeous! We grow these radishes every year, and they taste even better than they look, which is saying a lot. I'll be hanging on to this recipe till ours are ready to eat! I have never seen watermelon radishes but now I suddenly am on a quest to find some. Wow - what an absolutely beautiful dish! I love watermelon radishes and your photos are simply stunning! Gorgeous photos! We're growing a few different radishes but I can't remember what they are so we know for sure only when we pull them from the ground. It's a nice surprise. Having lived overseas for many years, I have only recently discovered the wonderful, and beautiful, watermelon radish. I have been buying them from our local CSA farm, putting them into salads. But I will highlight them, as you have; they deserve it. this is so beautiful I can't wait to try it. . . have never even heard of watermelon radishes but I am totally in! thanks! These photos (and your presentation) are stunning. I've never had watermelon radishes but I now want to try them.